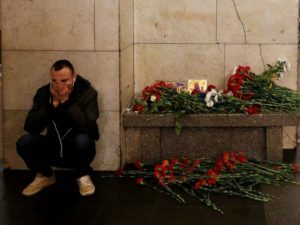 On Monday, April 3, a suicide bomber attacked the Russian subway at St. Petersburg, where 14 people died and at least 40 were injured. The metro press office has reported that the device was loaded with shrapnels and carried the equivalent of almost half a pound of TNT. The blast occurred in the blue line of the city’s subway between Sennaya Ploshchad and Tekhnologicheskiy Institut stations. Soon after the first bomb, a second one was discovered at Ploshchad Vosstaniya, a nearby station. The second device, disguised as a fire extinguisher containing approximately five times more TNT equivalent, did not go off. It is suspected that Ploshchad Vosstaniya was intended to be the main target of the attack. Following the attack, the metro lines were stopped across the city, the airport was shut down, and Uber and taxi drivers were running free rides to relieve the pressure from the infrastructure while the authorities were taking care of the damages. The terrorist suicide bomber was confirmed to be Kyrgyz-born Akbarzhon Jalilov, born on April 1, 1995. He had been living in St Petersburg for six years with a Russian citizenship he received through his father. Kyrgyztan is a central Asian country with a predominantly Muslim population. Kyrgyztan is a Russian ally that also hosts a Russian military base. Reuters has reported from Osh, that Akbarzhon is from an ethnic Uzbek family. The Islamic State has recruited a significant number of Islamist militants from Central Asia and Chechnya. It is speculated that the attack was carried out by Jalilov himself as a revenge for Russian air raids in Syria. Russia’s Investigative Committee has discovered several links in contact with Jalilov from Central Asian republics. As a result, eight people from the region were arrested as part of the investigation: two in St Petersburg and six in Moscow. Jalilov’s DNA was identified in the bombed subway car and his remains were later confirmed by his parents. In addition, his DNA was also found at the other station on the bigger explosive device. This has led authorities to believe that he has acted alone. When Russian investigators raided his home, where they confiscated tape, tin foil, and other suspicious items. Additionally, in the United Kingdom, Prime Minister Theresa May and the Secretary of State for Foreign and Commonwealth Affairs Boris Johnson expressed their horror and grief over the attack. First-year Boris Zyumbyulev is a staff writer. His email is bzyumbyu@fandm.edu.